Dental Tips - Delavan Lakes Veterinary Clinic, S.C.
Just like us, our companions need dental care—routine care at home as well as from your veterinarian. Our pets begin showing signs of oral problems when they are still kittens and puppies. Your veterinarian can teach you how to care for your companion’s teeth and gums and give you dental tips on what to be looking for. Brushing your companion’s teeth, providing a healthy “dental” diet, and safe teeth cleaning chew toys or treats can go a long way in keeping his or her mouth healthy. The earlier you start your pet’s dental routine the better. Buy a toothbrush specially designed for cats and dogs, or use a clean piece of soft gauze wrapped around your finger. Ask your veterinarian about toothpaste made for companions, or make a paste made from water and baking soda. Never use human toothpaste because it can seriously irritate your dog or cat’s stomach. Clean your companion’s teeth in small circular motions. Work from one side to the other focusing on one small area at a time. Brush two to three times per week. We all know our companion’s breath is never minty fresh, but if it smells abnormally repulsive and is accompanied by excessive drinking or urinating, vomiting, and/or a loss of appetite, it is time to go to the vet. At least once a week check your companion’s gums by lifting their lips and looking at their gums. Your pet’s gums should be pink—there should be no red or white, or any swelling, and no brownish tartar. Chew toys allow your companions to not only satisfy their natural tendencies to gnaw on things, but it also helps keep teeth clean by scraping away tartar. Nylon and rubber chew toys are great for this! Talk to your veterinarian about dry food specially formulated to slow down the formation of plaque and tartar. If you love to give your companion treats, opt for a treat made to promote better dental health. Don’t wait for your companion’s annual visit to schedule a dental check up, especially if you think something may be wrong. If you notice bad breath, excessive drooling, decaying teeth, inflamed gums, cysts or tumors, or loose adult teeth, contact your veterinarian right away. Dental health is the most over looked area in pet health. By having a healthy and proactive dental health routine, you can keep your companion in excellent oral health and also prevent more serious health problems like kidney, heart, and lung disease. 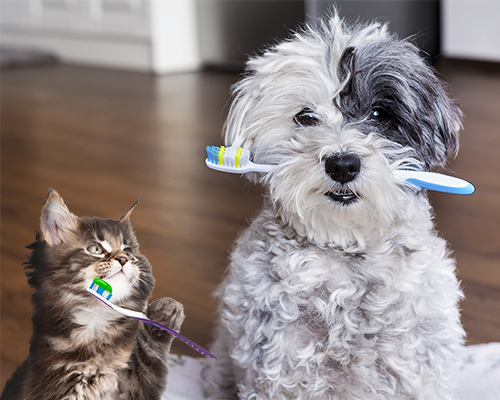 Dental hygiene is just as important for our pets as it is for us. Give us a call today to set up a dental hygiene appointment: (262) 728-8622.